You are here: Home / Business / Bye-bye to the bike chain? 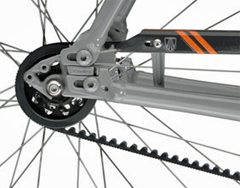 Bye-bye to the bike chain? Trek figures the low maintenance part will be a big sell to commuters, although unlikely to make the makers of chain lubricants very happy. “You don&apos;t have to put your hands on a greasy chain,” says Bjorling. “Your pants don&apos;t get caught in the system.” Trek&apos;s belt drive, in development for over a year, will be available on two models at Trek stores by the end of the year. “I think the market is finally ready for something like this,” Bjorling says, noting that another manufacturer has used belt drive on mountain bikes. “We really see this as an opportunity, and an advantage for urban and commuting bikes.” Waterford-based Trek is the largest domestic bicycle maker.